Why wait to start your FSU career when you can study abroad now? Were you offered the Seminole Pathway option by the Office of Admissions? Were you offered summer admission by the Office of Admissions? Are you ready to become a ‘Nole now? You can enroll as a Florida State student this Fall* through the International Programs First Semester Abroad (FSA) Pathway Program. You may choose one of four exciting locations: London, England; Florence, Italy, Panama City, Panama; or Valencia, Spain. We place great emphasis on ensuring your progress toward graduation will not be impeded by participating in this program. Classes you take can meet requirements of the Liberal Studies program, your minor, and perhaps even for your major. (Those intending to major in the sciences must choose the London, Panama City or Valencia locations.) Other academic benefits include small classes, personal attention from your faculty members, and courses that incorporate local academic, historical and cultural resources into the fabric of student learning. *A condition of the FSA Pathway Program is that you must enroll in an online course, Global Foundations, being offered by International Programs during the Summer C 2019 semester (June 24-August 2). After successful completion of this course (grade of C or better), you would then study abroad for the Fall 2019 semester and then return to main campus (Tallahassee) for the Spring 2020 semester. Each site abroad has a local staff of professionals who provide support and services to help you address the challenges of university life abroad. Our facilities, programs and excursions provide an environment conducive to academic achievement as well as social and personal development. In addition, Bright Futures and Florida Prepaid can be applied towards FSA program fees, as can other forms of financial aid. FSU International Programs will assist students with their transition back to the main campus in Tallahassee for the Spring. For details, please read our FSA Admissions Next Steps . For more information, please contact our dedicated Freshmen Program Coordinators in the International Programs office, phone (850) 644-3272, toll free (800) 374-8581. There is limited space available for this program, so we encourage you to apply as soon as possible. We hope to have you as a part of the Florida State family through the FSA Pathway Program. Fall/Spring only: Students must enroll in a class with a prefix of ITA, ITT, ARH, EUH, HUM, or enroll in an IFS course. Program housing is apartment-style within a twenty minute walk of the study center. Apartments are shared double and triple-occupancy bedrooms, with full bathrooms, TV, phone, living room with individual study desks, and a utility kitchen. Other amenities include a large fully equipped common kitchen, free laundry facilities, wi-fi, and a lovely spacious garden. If these spaces are filled, students will be housed in comparable accommodations within central Florence. Overnight guests are not allowed in program housing. Please click here for a listing of recommended hotels in Florence. The Italian Studies Florence Center Minor is meant to enhance the student’s academic experience in Italy. The minor is built around residency in Florence, but can be pursued before and after it as well: 15 credits are required, 9 of which must be earned in Florence. 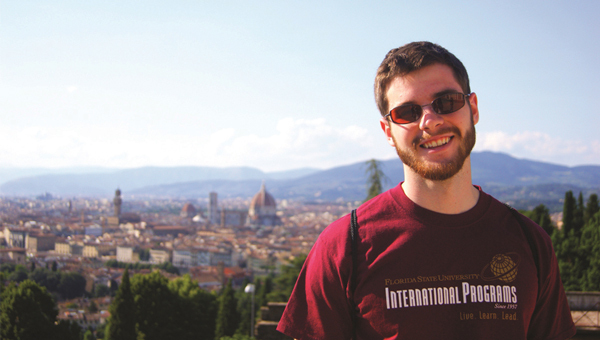 Students may choose from various disciplines in Italian Studies. Consult the FSU Bulletin and contact International Programs for formal declaration of the minor. Students will be housed in a furnished, dormitory style complex within the City of Knowledge. Each room is equipped with AC, hot water, a telephone, television, and wireless internet. Students will also have access to a kitchenette with a microwave, coffee maker, and refrigerator. Other amenities include a living-dining area featuring a fully equipped kitchen, coin-operated laundry, and vending machines. The complex is a 15-minute walk to the main classroom building, though shuttles will be available between the main building and dormitory complex during the week. A selection of small restaurants and a convenience store make it easy for students to purchase household items, grab a bite to eat, or enjoy a leisurely meal with other students and City of Knowledge residents. Fall/Spring only: Students must enroll in a class with a prefix of SPN, SPT, SPW, ANT, EUH, HUM, or IFS. The Iberian Studies Valencia Center Minor enhances and provides focus to a student’s program in Spain. The minor is built around the Valencia residency, but can be pursued before and after it as well: 15 credits are required (to include at least two disciplines), of which 9 credits must be taken in Valencia. Students may choose from various Iberian Studies disciplines. Consult the FSU Bulletin and contact International Programs for formal declaration of the minor. Accommodations feature the latest technology, including a computer lab, library, and wi-fi throughout the common areas, classrooms, and apartments. Students live in shared rooms in fully equipped apartments complete with kitchens, lounge space, and TVs. The center offers 24/7 front desk coverage and free laundry facilities. If these spaces are filled, students will be housed in comparable accommodations within central Valencia. Overnight guests are not allowed in program housing. For a list of hotels near the campus, please click here. This course introduces the origin and development of human lifeways with emphasis on non-Western societies. A comparative perspective is used to examine language, social organization, religion, values, and technology. Attention is also given to contemporary world problems. The course is set against the historical background of Florence and looks at art and architecture in the context of patronage; that of the church, the guilds, the merchants and the Medici, the ruling family of the city. The Renaissance produced outstanding artists such as Donatello, Botticelli, Verrocchio, Leonardo da Vinci, Michelangelo and Raphael; but these artists could not have existed without their patrons. It is this inter-connection which is our theme. The course will examine the emergence of Renaissance Florence via site visits to churches, palaces, museums and classroom sessions. The story is an unprecedented and excititng one: one small city produced a staggering array of artistic talent in a short period of time. Classical antiquity was the model, not only in artistic terms but in philosophical and political ones as well: Florence saw the rebirth of classical antiquity. The impact of that rebirth, that renaissance, still affects us today: our ways of thought, our ways of seeing are conditioned by that momentous period which changed the past forever, and ushered in the first modern era. This course includes creative expression and communication using a variety of black and white media. This course provides general acquaintance with some of the facts, concepts and scientific methods of astronomy. As a liberal study course, the goal is to help students learn some basic facts of astronomy as well as gain an appreciation of astronomy as a science, the universe, and the current scientific ideas about its history and its future. This course provides students with an introduction to the mythological traditions from a diverse group of ancient cultures, including those of Greece and Rome, the Near East, Northern Europe, India, China, Africa, and the Americas. Fashion is by its very nature a communication tool. Clothes and garments are powerful vehicles of meanings and values, able to shape an individual’s personality as well as an entire “spirit of time”. This course traces the multiple connections between the fashion and media industries, from the birth of fashion magazines in France in the late XVII century, until today, an era characterized by the digital and one-to-one communication model. The course emphasizes the material realities, pragmatic and creative dynamisms, fantasy components, and essential visual faces of fashion. We will analyze all the most important fashion media channels, highlighting the specific characteristics of each medium: magazines & editorials, photography, movies, TV commercials, shops & retail spaces, videos, exhibitions, fashion shows, blogs and social media. The course will end with a real TV interview made by students to some of the leading fashion designers and creative people of the Italian fashion system and industry. Please note: For this course to count toward the major, students must apply for and be admitted to the School of Communication. This course prepares students to design and implement a social media campaign, and introduces them to the social, political, and ethical contexts of using new technologies. The class takes either a social advocacy or a marketing perspective. Fashion is by its very nature a communication tool. Clothes and garments are powerful vehicles of meanings and values, able to shape an individual’s personality as well as an entire “spirit of time”. This course traces the multiple connections between the fashion and media industries, from the birth of fashion magazines in France in the late XVII century, until today, an era characterized by the digital and one-to-one communication model. The course emphasizes the material realities, pragmatic and creative dynamisms, fantasy components, and essential visual faces of fashion. We will analyze all the most important fashion media channels, highlighting the specific characteristics of each medium: magazines & editorials, photography, movies, TV commercials, shops & retail spaces, videos, exhibitions, fashion shows, blogs and social media. The course will end with a real TV interview made by students to some of the leading fashion designers and creative people of the Italian fashion system and industry. “Made in Italy” is much more than just a geographical reference; Made in Italy is a promise. A promise of style, culture and know-how embedded in each true Italian “good”. This course covers the key moments in the development of this legacy, based on the combination between tangible and cultural values, and innovation and heritage. The course analyzes the key moments in the development of Italian fashion in relation to Italian culture and society, from its roots in the Renaissance through to the cultural shift of “economic miracle” and modernity in the 20th century, then on the current Made in Italy design and its protagonists compared with the international scenario. Fashion is always a matter of at least three elements: production; representation and consumption. During this course we will stress all of these main issues, helped by on-site visits to museums, fashion industries and craftsmanship laboratories in order to illustrate Italy and particularly Florence’s dominant role in fashion yesterday, today and tomorrow. The course will end with a proposal for a fashion exhibition about Made in Italy, that will be presented to some of the leading Italian textile & fashion museums. This course traces the development of Italy from the Enlightenment to the present. Discussions concentrate on the major social, political, and intellectual currents, centering on the unification movement, the crisis of the Liberal State, and Fascism. This course is for those who have completed through the third semester of Italian language (ITA2220). This course provides an introduction to wines of the world with a focus upon the importance to global cultures. Students learn about these regional wines and the interrelationship with their cultures and heritage. This course is an introduction to basic wine knowledge that, together with wine tasting, enhances student understanding and appreciation of wine and its place in our culture and heritage. May not be taken as an S/U course. The course is intended to introduce students to the major issues and themes in Italian history from the second half of the nineteenth century to the present day. We will investigate key issues such as the process of nation-building in the Liberal period; Fascist Italy; the gap between citizens and government; the centrality of the family; Italy in the Cold War; the Economic Miracle; Berlusconis Italy. We will also discuss the changes that have occurred as a result of the combined effect of industrialization, urbanization and secularization. Special emphasis will be given to the role of the South in the construction of an Italian national identity. We will go to an historical café and to a museum. This course centers around an ancient political question: how can we live together? In the 21st century new forms of participation are developing which should make us question the traditional political paradigms. The course addresses these problems by examining evidence from different contexts and by adopting a multidisciplinary approach. This course offers an excursion through eight centuries of Florentine history, engaging students with a variety of sources: primary literary texts, original iconography, visual arts, films, and the direct observation of urban landscape. The city itself, as far as possible, serves as an open-air classroom. This introductory course gives the student basic grammatical structures to enable speaking, understanding, reading, and writing at the elementary level. May not be taken by native speakers. May not be taken concurrently with ITA 1111, 1121 and/or 2220. This course builds upon the students ability to speak, understand, read, and write Italian at an elementary level. May not be taken by native speakers. May not be taken concurrently with ITA 1111, 1120 and/or 2220. This course stresses skills in reading and conversational Italian at the second-year level. Readings are supported by discussions of the materials. This course completes the baccalaureate degree requirement. May not be taken concurrently with ITA 1111, 1120 and/or 1121. May not be taken by native speakers. This course presents a review and further study of grammar and idiomatic constructions. Composition practice augments the skills developed. After a general overview of Italian history and culture, this course introduces students to a sample of novels, plays, paintings and movies that present key aspects of Italian culture and its achievements. Taught in English. This course is an introduction to the cultural developments and sociopolitical changes in modern Italy from the Risorgimento to the formation of a nation. Students examine Fascism's influence on the national culture, as well as consider the contemporary impact of immigration on diversity. Offered in English. This course offers and introduction to Italian cinema: history, practices, and protagonists. Taught in English. This course introduces students to the critical reading of short stories dating from the nineteenth through the twenty-first century. This course teaches students to identify tone, narration, form, theme, characterization, and other formal aspects of short fiction. Students are encouraged to formulate their own interpretation of the works read, based on their developing ability to recognize the decisions each author has made in constructing the text. This course covers set theory; symbolic logic; counting principles; permutations and combinations; probability; statistics; geometry; applications and history of mathematics. Recommended background: two years of high school algebra. Course is not intended for students whose programs require precalculus or calculus courses. This course is a broad overview covering important psychological principles and findings within the major subfields of psychology, and the basic scientific methods employed. A "bio-psycho-social" approach is emphasized throughout so that all behaviors (including how we think, feel, and act) are discussed in terms of biological, psychological, and social determinants and consequences. This course surveys the United States from the end of the Civil War to the present with emphasis on social, economic, and political problems of the 20th century. May not be taken by students with test credit in American history. This course is a regional survey of the human occupation of the face of the earth, local cultures, political systems, and development problems. This course explores the causes of local and global environmental problems and their impacts, including resource use, pollution, ecosystems, and population growth. This course explores types of environmental hazards (natural and human-made) and their effects, techniques for the analysis of risks, and strategies for recovering losses. This course is a survey of GIS topics, including locational control, spatial data structures, modeling and analysis, and future trends in decision support, sensors, and geographic methods. This course examines environmental issues as they relate to geological phenomena, which include volcanic and earthquake hazards, resource and land-use planning, air and water pollution, waste disposal, glaciation and sea-level change, landslides, flooding, shoreline erosion, and global change issues. Course credit may not be received for this course and also GLY 1000 or 2010C. Credit can be received for taking GLY 1000L. This course introduces students to the study of international relations. Major topics include the different actors that participate in international relations and the different goals they pursue, the processes of conflict and cooperation, and recent trends in international politics. This course is a cross-cultural history of Latin America focusing on women, Native Americans, African-Americans, mestizos, and mulattoes in historical context. The course does not count as credit toward the history major. This course focuses on Cuba, Puerto Rico, and other Caribbean societies. European and United States colonialism and local Caribbean forces are studied to help understand the area's social, economic, and political problems and prospects. This course introduces students to key terminology, concepts, and methodologies for the study of complex literature. The course provides a groundwork in literary types for non-majors and is also strongly recommended as preparation for upper-level (3000- or 4000-level) coursework in the field. This course covers polynomial, trigonometric, exponential, and logarithmic functions; first and second derivatives and their interpretations; definition and interpretation of the integral; differentiation rules; implicit differentiation; applications of the derivative; anti-derivatives; fundamental theorem of calculus. This course must be taken for reduced credit by students with prior credit for some of the content. This course covers techniques of integration; applications of integration; series and Taylor series; differential equations. This course must be taken for reduced credit by students with prior credit for some of the content. This course covers functions of several variables and their graphical representations; vectors; partial derivatives and gradients; optimization; multiple integration; polar, spherical, and cylindrical coordinate systems; curves; vector fields; line integrals; flux integrals; divergence theorem and Stokes' theorem. This course must be taken for reduced credit by students with prior credit for some of the content. This course covers behavioral concepts, techniques, and applications for managing human resources in all types of organizations. This course is a required prerequisite for all marketing courses. Gives the student an understanding of the decision areas and the ability to utilize marketing concepts to make business decisions. This course has a recommended background of two years of high school algebra. Topics include financial mathematics; linear and exponential growth; numbers and number systems; history of mathematics; elementary number theory; voting techniques; graph theory; game theory; geometry; and computer applications. This course is designed to provide students with an understanding of how and why things move. Topics covered include kinematics, forces, energy, momentum, oscillations, and thermodynamics. The course is intended for physical science majors and engineers and to be taken as a sequence with General Physics B (PHY 2049C) and Intermediate Modern Physics (PHY 3101). Completing Modern Physics entitles students to a minor in physics. Calculus is used in this course. This course is an introduction to electricity, magnetism, and optics for physical science majors. Calculus is used. Course consists of lectures, recitations, and laboratory. This course is the first of a three-semester sequence of courses for students with no prior knowledge of the Spanish language, either at the high-school or native-speaker level. The course emphasizes oral communication and grammatical expertise, as well as listening comprehension. Students read short texts and write paragraphs and short compositions in Spanish. May not be taken concurrently with SPN 1121, 1124, and/or 2220. May not be taken by native speakers. Some sections may be computer-assisted. This course emphasizes oral communication and grammatical expertise, as well as listening comprehension. Students read short texts, poems, and write compositions in Spanish. May not be taken concurrently with SPN 1120, 1124, and/or 2220 or be taken by native speakers. This liberal studies course deals with the origins and development of political, economic, social, and intellectual antecedents of the modern world from the end of the Middle Ages to 1815. Students who have previous college credit in Western civilization courses covering the same general chronological period cannot receive credit for WOH 1023. May not be taken by students with test credit in European history. This liberal studies course deals with the origins and development of political, economic, social, and intellectual antecedents in the modern world since 1815. Students who have previous college credit in Western civilization courses covering the same general chronological period cannot receive credit for WOH 1030. May not be taken by students with test credit in European history. In this course, students gain an overview of the development of Western culture from Antiquity to the present as it is expressed through the arts (painting, sculpture, architecture, literature, music, film and the performing arts), and especially through literature. The course examines the human condition through culture and the arts to better understand how the humanities are interconnected. This course offers an introduction to the thought, literature, and arts of Western culture from the Renaissance to the Enlightenment. Spain is a complex and vivacious country with a rich and hybrid cultural background. In this course, we will study the history, culture and society of the different people who have contributed to the formation of the current European nation from its origin to the present. The students will learn about Spain not only through readings and lectures, but also, and most importantly, through real life experiences, such as excursions and visits to the actual historical sites, monuments, museums, churches and other places of interest. We will also study the fundamental importance of Spanish food culture as a socio-cultural element worthy of serious analysis. This course will also make use of select films to enhance our analysis of Spanish culture. This course counts as a Core Course for the Iberian Studies minor. This course may be repeated to a maximum of six (6) semester hours. This course focuses on the elements of nutrition and factors influencing the ability of individuals to maintain good nutrition status. Federico García Lorca and Ernest Hemingway are two of the most internationally recognized literary and cultural figures of the 20th century. That is, not only are they viewed with great interest and even division and controversy in their birth countries of Spain and the United States respectively, but they continue to cast a long shadow across the globe and especially over the Atlantic. Furthermore, not only did each of these two compelling figures leave a deep footprint in the other´s country, but they were also influenced and greatly inspired by the socio-cultural patrimony of the other´s homeland. By studying and analyzing Lorca in America and Hemingway in Spain students will explore an inter-cultural journey that reaches the core of how many Spaniards view America and how many Americans view Spain to this day. In this course we will engage, explore and envision Lorca in America and Hemingway in Spain within the enriching comparative context regarding a number of points of analysis: socio-cultural identity and customs, the environment, ethnicity, sexual identity, religion, geography, the artistic merit versus the ethical complexities of the bullfight, human rights and the cruelties of warfare. This course satisfies the Liberal Studies Humanities and Cultural Practice requirement. This course provides an overview of the environments, markets, institutions, challenges, strategies, and operations of international and cross-cultural business; the globalization of business and associated challenges posed for the competitiveness of the modern enterprise; and the orientations, strategies, and tactics appropriate for international business success. This course provides an introductory survey of various musical traditions in a global perspective, exploring music both as a phenomenon of sound and as a phenomenon of culture. Students analyze tradition as a constantly evolving and transformative entity that nurtures and sustains core cultural values. The social context of music, including social structure, geography, globalization, mass mediation, concepts of religion, instruments, aesthetic priorities, and cultural beliefs that inform music within given cultural contexts is emphasized. This course emphasizes oral communication and grammatical expertise, as well as listening comprehension. Students read short stories, poems, and articles, and write extended compositions and papers in Spanish. May not be taken concurrently with SPN 1120, 1121, and/or 1124 or be taken by native speakers. This course completes the intermediate Spanish skills sequence and finishes the review of the grammar sequence begun in SPN 2220. Students deepen their functional skills in comprehending, speaking, reading, and writing Spanish, and gain an overview of Hispanic culture in various countries. Not open to native or heritage speakers of Spanish. This course covers the theory and practice of Spanish grammar and its applications to compositions. Can be taken concurrently with SPN 3400. This course offers intensive Spanish for heritage speakers who have had little or no formal training in the language. Writing skills are emphasized over oral communication. This course develops communicative proficiency and accuracy in both reading and writing Spanish. Can be taken concurrently with SPN 3300. Not open to native or heritage speakers of Spanish. This intermediate-level language course is aimed at raising cross-cultural awareness in international business. It is also designed to better prepare students to meet the challenges of a global economy. This course stresses composition in Spanish with less emphasis on translation from Spanish into English. For students with prior knowledge of essential points of Spanish grammar. This course is a study of the films, movements and directors of Hispanic cinema. May be repeated to a maximum of six semester hours. Taught in English. IP scholarships are not available to in-state/out-of-state students currently on the First Year Abroad (FYA program or First Semester Abroad (FSA) program or those who are directly enrolled at FSU-Panama. *Early application is advisable as program enrollment is limited and acceptances are offered on a rolling basis. If you are a Pathways student, please adhere to the Office of Admissions deadline provided in your Pathways offer letter. **All admitted applicants must pay the non-refundable commitment fee by the due date to reserve a spot on the program. If you are ready to commit early, you can earn a $250 discount off your program fee by paying the commitment fee by the Early Commitment Discount Date.